Want the option to upgrade to the Outlaw? For $10 more you can have the easy to clean, removable bowl option of the Outlaw! How about the Vagabond or the High Noon? For $15 more you can have that too! We partnered with Undurcuvur out of Michigan to bring this revolutionary dugout. It is 100% odor proof, waterproof, and airtight. This is a glass stash jar and a custom one hitter bat that we wrapped head to toe in soft rubber to create the the smallest odor-blocking glass “all in one” stash container on the market. 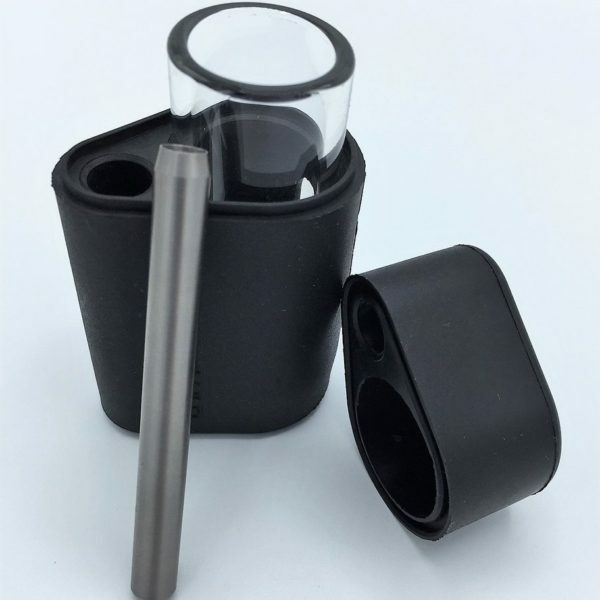 The glass storage jar has 2.5 mm thick sides and a super thick 7 mm bottom. The glass has to be made to exact dimensions in order to for all the pieces to fit together correctly. Our focus on quality is relentless. Undurcuvur picked the proper blend of polymers (rubber) to eliminate “gas permeability” which is how odor is transported through rubbers like silicone. Silicone rubber has 450 TIMES the gas permeability of our rubber blend. So if a competitor claims to be smell proof but is using Silicone in their designs we would find that claim very difficult to believe. This product was custom designed and tested exhaustively to make sure we deliver the experience you are looking for.